Bright light at night is known to suppress melatonin secretion. Novel photoreceptors named intrinsically photosensitive retinal ganglion cells (ipRGCs) are mainly responsible for projecting dark/bright information to the suprachiasmatic nucleus and thus regulating the circadian system. However, it has been shown that the amplitude of the electroretinogram of ipRGCs is considerably lower under flickering light at 100 Hz than at 1–5 Hz, suggesting that flickering light may also affect the circadian system. Therefore, in this study, we evaluated light-induced melatonin suppression under flickering and non-flickering light. Twelve male participants between the ages of 20 and 23 years (mean ± S.D. = 21.6 ± 1.5 years) were exposed to three light conditions (dim, 100-Hz flickering, and non-flickering blue light) from 1:00 A.M. to 2:30 A.M., and saliva samples were obtained just before 1:00 A.M. and at 1:15, 1:30, 2:00, and 2:30 A.M.
A repeated measures t test with Bonferroni correction showed that at 1:15 A.M., melatonin concentrations were significantly lower following exposure to non-flickering light compared with dim light, whereas there was no significant difference between the dim and 100-Hz flickering light conditions. By contrast, after 1:30 A.M., the mean melatonin concentrations were significantly lower under both 100-Hz flickering and non-flickering light than under dim light. Although melatonin suppression rate tended to be lower under 100-Hz flickering light than under non-flickering light at the initial 15 min of the light exposure, the present study suggests that 100-Hz flickering light may have the same impact on melatonin secretion as non-flickering light. The development of artificial lighting systems has allowed us to have a bright environment at night, bringing comfort and safety. However, light has also been reported to have a range of physiological impacts on humans, such as changes in pupillary constriction [1–4], autonomic nervous function [5–7], brain activity , and cortisol secretion . Furthermore, bright light at night is known to delay the circadian phase [10–12], resulting in disruption of the circadian rhythm , which, in turn, can lead to poor sleep and various kinds of health risks, such as cardiac disease and depression . Bright light also suppresses the night-time secretion of the hormone melatonin [15–18], which is produced by the pineal gland and has several physiological activities, including anticancer activity [19–21]. As an example of the anticancer activity, Blask et al. indicated that human breast cancer xenografts with melatonin-rich blood exhibited suppressed proliferative activity and linoleic acid uptake/metabolism, compared with melatonin-deficient blood. Consequently, the International Agency for Research on Cancer lists shiftwork that involves circadian disruption as a probable carcinogenic factor (Group 2A) and a prospective study has suggested that residential outdoor bright light at night may contribute to breast cancer risk . Therefore, there is a real need to understand the physiological effects of light so that we can create healthy artificial lighting environments. Novel retinal photoreceptors known as intrinsically photosensitive retinal ganglion cells (ipRGCs) or melanopsin-containing retinal ganglion cells (mRGCs) are mainly responsible for projecting dark/bright information to the suprachiasmatic nucleus and thus regulating the circadian system [23–26]. ipRGCs have several different properties from cones and rods, which are the traditional photoreceptors found in the eye. For example, the spectral peak sensitivity of ipRGCs is approximately 480 nm , resulting in an acute light-induced suppression of melatonin production in blue light [27–30]. Furthermore, the depolarizing voltage response of ipRGCs increases more slowly in response to a light pulse (i.e., has a long latency) and declines more slowly after the onset of the light pulse (i.e., exhibits sustained depolarization) compared with traditional photoreceptors . In an examination of ipRGC electoretinograms (ERGs) under different light conditions, Takao et al. found that ipRGCs that were exposed to flickering light at 100 Hz had steady-state ERGs, suggesting a high temporal frequency sensitivity, but lower-amplitude ERGs than those obtained under 1–5-Hz flickering light. Therefore, it appears that the flickering condition of light may also impact our circadian system. In this study, we evaluated light-induced melatonin suppression under 100-Hz flickering and non-flickering blue light. We chose these conditions because ipRGCs are most sensitive to light at a wavelength of 480 nm and some artificial light sources such as fluorescent lamps flicker at approximately 100 Hz. Twelve Asian male subjects aged between 20 and 23 years (mean ± S.D. = 21.6 ± 1.5 years) participated in this study. Each subject gave informed consent to participate, had no history of psychiatric or sleep disorders, and was free from any medical conditions at the start of the experiment. The subjects were instructed to abstain from alcohol for 1 day and from caffeine and smoking for 3 h prior to the experiment. In addition, they were asked to keep a regular sleep-wake schedule (sleep onset between 1:00 and 2:00 A.M. and wake between 8:00 and 9:00 A.M.) for 6 days prior to the experiment. These sleep-wake schedules were checked by actigraphy devices (MotionWatch 8; CamNtech Ltd., Cambridge, UK) before each experiment. The experimental design followed the principles outlined in the Declaration of Helsinki and was approved by the ethical committee of the Faculty of Design, Kyushu University, Fukuoka, Japan. The experiments were carried out at the Research Center for Human Environmental Adaptation of Kyushu University between August and September 2016. The 100-Hz flickering and non-flickering light conditions were delivered to each subject from a 0.5-m cubic light box. The two light conditions were obtained from arrays of blue light-emitting diodes (LEDs) on a board, which was placed with a white diffuser in front of the subject. The spectral emissions of the blue LEDs peaked at 465 nm, with a full width at half maximum of 24 nm. The 100-Hz flickering light was modulated by a pulse generator (PCI-6105; Interface Corp., Hiroshima, Japan) installed in a computer (AT-960, Epson Direct Corp., Matsumoto, Japan) with a purpose-built pulse width modulator circuit. The LED was on for 1 ms and off for 9 ms (10% duty ratio) in the flickering light condition. Before each experiment, the melanopic illuminance of the two light conditions at the subject’s cornea was adjusted to 38.0 μW/cm2 (irradiance was almost 52.0 μW/cm2) using a direct-current power source (KX-100H; Takasago Ltd., Kawasaki, Japan) and a spectroradiometer (LA-105; NK System, Osaka, Japan); Melanopic illuminance is a representation of irradiance by the activity of ipRGC . The illuminance and photon density at the cornea were 30.2 lx and 14.09 log photons/s/cm2, respectively. Saliva samples were collected using non-cotton (polypropylene-polyethylene complex swab) collection devices (Sarstedt K.K., Numbrecht, Germany) to avoid any interference with the salivary melatonin assay results . Saliva samples were centrifuged at 1500 g for 5 min and then frozen at − 30 °C until assay. Melatonin levels in the samples were analyzed using a commercially available radioimmunoassay (RIA) kit (Direct Saliva Melatonin RIA; Buhlmann Laboratories, Allschwil, Switzerland), which had a limit of detection of 0.9 pg/mL and a limit of quantification of 0.2 pg/mL. The mean intra- and inter-assay coefficients of variance were 7.9% and 9.8%, respectively. Melatonin suppression = (concentration at each time point after light exposure − concentration before light exposure)/concentration before light exposure. Differences in the mean melatonin concentration and melatonin suppression rate over time and between light conditions were analyzed using a two-way within-subject repeated measures analysis of variance with the Huynh-Feldt ε correction, to evaluate F ratios for repeated measures involving more than one degree of freedom. Post hoc analyses were then conducted using repeated measures t tests with the Bonferroni correction for the mean melatonin concentration and repeated measures t tests for the melatonin suppression rate. All statistical analyses were performed in SPSS (version 22.0; SPSS, Chicago, US) with a significance level of p < 0.05. Data from one subject were excluded from the analysis because his melatonin levels were lower than the limit of detection of the RIA kit (0.9 pg/ml). Therefore, data from 11 subjects are reported below. Temporal changes in the mean melatonin concentrations under the three light conditions are shown in Fig. 2. The light condition had a significant effect on melatonin concentration (F2.20 = 21.00, p < 0.01, ε = 0.66), and there was a significant interaction between the time interval and light condition (F8.80 = 11.75, p < 0.01, ε = 0.30). Post hoc comparisons showed that the melatonin concentration was significantly lower under non-flickering light than under dim light at 1:15 A.M., whereas there was no significant difference between the concentration under dim light and 100-Hz flickering light. However, after 1:30 A.M., the mean melatonin concentrations were significantly lower under both 100-Hz flickering and non-flickering light than under dim light (Fig. 2). Temporal changes in the melatonin suppression rate under the three light conditions are shown in Fig. 3. Time interval had a significant effect on the melatonin suppression rate (F3.30 = 11.88, p < 0.01, ε = 0.50), and there was a significant interaction between the time interval and light condition (F3.30 = 4.01, p < 0.05, ε = 1.00). The melatonin suppression rate tended to be lower under 100-Hz flickering light than under non-flickering light at 1:15 A.M. 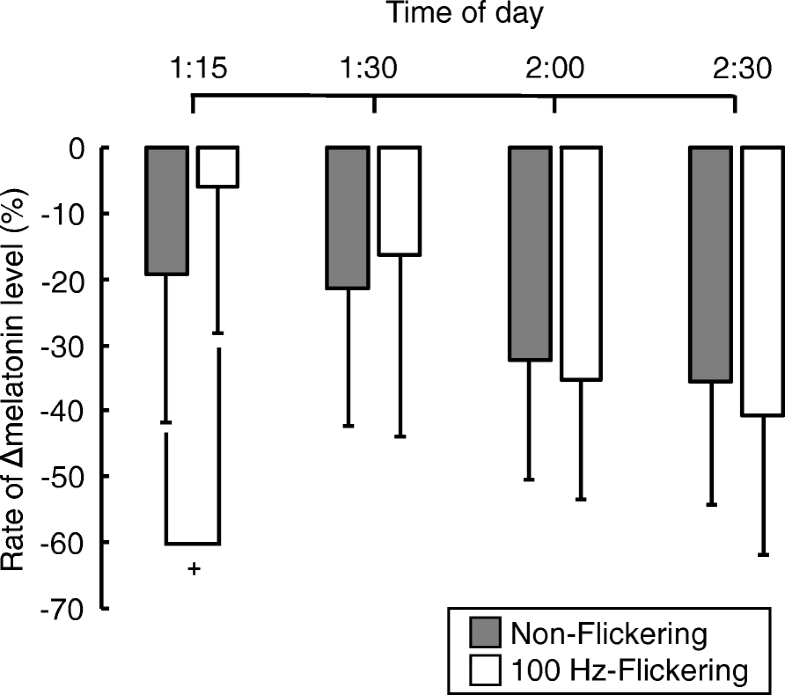 However, after 1:30 AM, there was no significant difference in the melatonin suppression rate between the 100-Hz flickering and non-flickering light conditions (Fig. 3). Melatonin suppression rate under 100-Hz flickering light showed a tendency to be lower than under non-flickering light 15 min after the start of the experiment, despite having no significant difference on mean melatonin concentration between the light conditions. This finding suggests a capability that the high-frequency flickering and non-flickering light may have a different impact on melatonin secretion. From a physiological perspective, this may be explained by the temporal properties of ipRGCs. Takao et al. obtained larger-amplitude ERGs from mouse retinae under 1–5-Hz flickering light than under 100-Hz flickering light. Therefore, it is possible that the amplitude of ERGs under non-flickering light may also be larger than under 100-Hz flickering light. Another explanation may be the rapidity of adaptation of ipRGCs to the light conditions. It has previously been reported that the ERGs of ipRGCs are significantly larger in dark-adapted retinae than in light-adapted retinae . In the present study, the subjects spent 1 h in dim light conditions (≤ 3 lx) before the light exposure, allowing their retinae to adapt to this. Therefore, although we have no conclusive evidence, there may be a difference in the rapidity of adaptation of ipRGCs to 100-Hz flickering and non-flickering light. These findings indicated a small difference in mean melatonin concentration between 100-Hz flickering and non-flickering light at 1:15 A.M., which may have health benefits given the anticancer activity of melatonin. However, the efficacy of this treatment may be limited, as we only observed a difference in melatonin suppression between 100-Hz flickering and non-flickering light at 15 min after the light exposure, indicating that the ipRGCs may respond to 100-Hz flickering light in the same manner as to non-flickering light but after a delay of several minutes. In addition, 100-Hz flickering light may not prevent a shift in the circadian phase, as it has previously been found that a sequence of 2-ms flashes of bright light occurring once per minute for 60 min delays the melatonin onset time, despite having no effect on melatonin secretion , and that 2-ms light flashes change the circadian phase even while the subjects are asleep . Therefore, it appears that circadian phase shifting is more sensitive to flickering light than melatonin suppression. Although this study suggests that high-frequency flickering light may have less impact on melatonin secretion than non-flickering light, the difference was small and limited. However, the effect of 100-Hz flickering light on melatonin secretion may be related to the light intensity. It has been shown that ipRGCs show continued discharge after the light offset following exposure to bright light, whereas no such effect occurs at lower light levels , and the amplitude of the ERG response of ipRGCs between dark-adapted and light-adapted retinae differs more greatly at higher light levels than at lower light levels . Therefore, further research is needed to determine how best to create a healthy artificial lighting environment. This study evaluated light-induced melatonin suppression under 100-Hz flickering and non-flickering blue light. 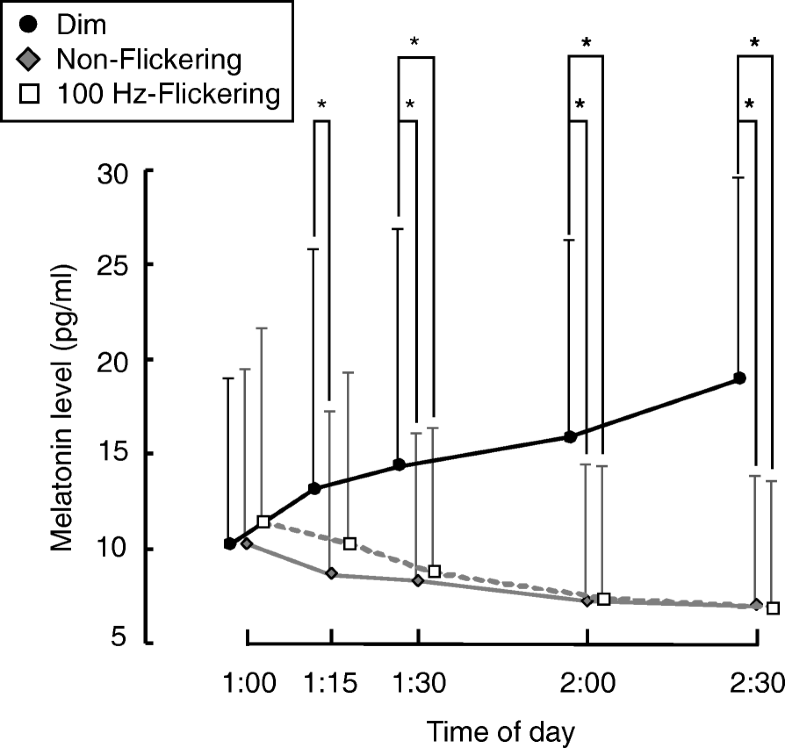 The melatonin concentration was significantly lower under non-flickering light than under dim light 15 min after the light exposure, whereas there was no significant difference between the concentration under dim light and 100-Hz flickering light. These findings suggest that 100-Hz flickering light may have the same impact on melatonin secretion as non-flickering light. This work was supported by JSPS KAKENHI (Grant Number 15H04431). The individual raw data will not be available because of the ethics policy. TK contributed to the study design and data analysis and drafted the manuscript. YH contributed to the study design and conducted the experimental work. JT contributed to the designing and creating of the experimental lighting system. YK contributed to the study design and checked the health condition of the subjects. TK, YH, JT, and YK have approved the final manuscript. The experimental design of this study was approved by the ethical committee of Faculty of Design, Kyushu University. All participants were instructed about this study and have written consent before the experiments. All participants have written consent for publication.